David and Katherine Wilson once again hosted the January Handicap in Placitas, their traditional“Run and Eat Biathlon.” This year’s course took us up onto the Crest Trail, requiring some fancy dance steps across several crusted (and slippery) snow patches; then down (yay!) and along paved roads; and finally up and up (boo!) back to the Wilson home, for a total of 3.25 miles. This was a two-person combined estimated time event (no watches allowed), and several participants got remarkably close to their estimates, made after hearing a description of the course from our host. A few missteps by Alex Gordon put him at a disadvantage in the time department, but his young legs got him caught up and across the finish line ahead of many others. Winning team was Wendy Wiggins and Neil Galvez, with a combined difference of only 1:12 from their predictions. 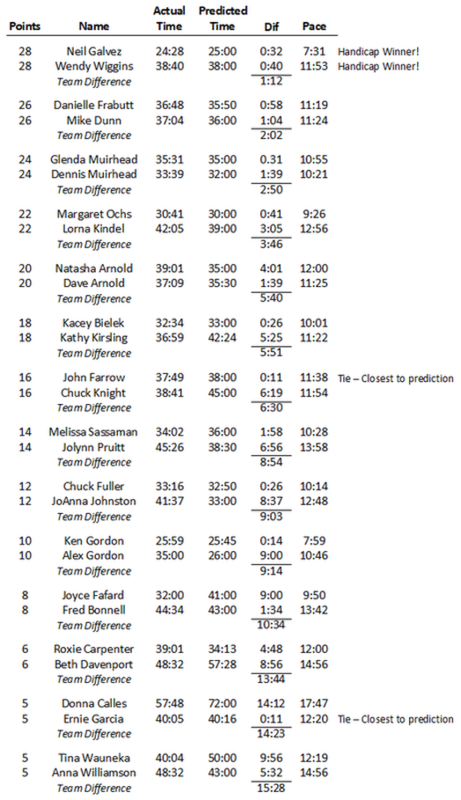 As individuals, both John Farrow's and Ernie Garcia's actual times were a mere 11 seconds off their projections - and both ran faster than expected! Following the race, everyone enjoyed a lovely brunch, including a delicious French toast casserole from host Katherine Wilson, some wonderful meatballs, yummy breads and cakes and cookies, and everything that makes our Handicaps special! Thanks to all for their contributions to the table. Predicted time run - no watches! Everyone starts at the same time! Once again, David and Katherine Wilson will host the January Handicap in Placitas, called “The Run and Eat Biathlon.” It includes a potluck brunch at the Wilson house afterward. The race route, as always, is dependent on the footing conditions. 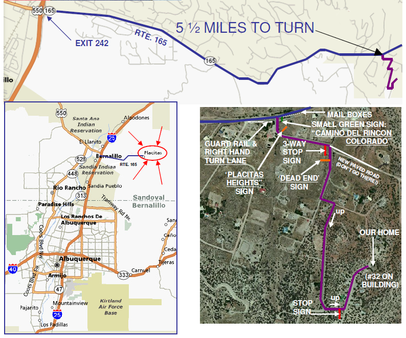 Last year it included a run through Placitas village; the year before it involved running up to the Tunnel Springs road and back on Route 165. The distance is always 4 miles, plus or minus, and might include some trail running. It is never flat! After the run, the eating half of the Biathlon takes place. If you don’t set a PR in the run, you can surely achieve one in the eating part!If you want to contribute, bring along some favorite dish or beverage to share. To get to the start of the race, go north on I-25 and get off at exit 242 (the northern of the two Bernalillo exits). Go east (right) toward the mountains. This is Route 165. Go about 5.5 miles, and on the right look for a guardrail, some mailboxes, and a small turning lane onto Camino del Rincon Colorado. There will be some kind of sign indicating the race. Follow the signs to Camino a las Estrellas (#32). You can call us at 554-2337 at any point when you are lost.